Island Club At Corkscrew Homes: Rare Find…Single family home located in Estero, in the gated community of the Island Club. Very well maintained 3-bedroom 2 ½ bath. Situated in a established community with a beautiful 23 acre spring-fed freshwater lake. This home without a doubt is a must see. Island Club offers a quality of life at a very affordable cost. Downstairs master bedroom & den and two spacious upstairs bedrooms, each with a large closet and direct access to the Jack & Jill guest bathroom. All around roll-up Storm Shutters Island Club nestles around a 23-acre fresh water lake. Why buy a condo when you can have a single family home in a gated community. Best of all, Island Club is very affordable. HOA fees include Clubhouse with lots of activates, Tennis, Pickle Ball, Shuffle Board, Bocce ball, Pool and Spa also includes your Cable TV and water and lawn maintenance, all for $590.00 per 1/4. 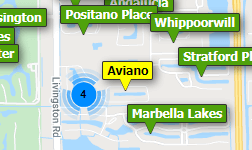 Close to malls restaurants, RSW Airport and Hertz arena and FGCU. Estero Has it all. Island Club At Corkscrew Homes: This Home is Impeccable!! 2-bedroom 2 bath hardwood floors Throughout. Family Room/Den. New Kitchen with Granite Counters, new appliances, rollup shutters enclosed Lanai, Concrete Patio. This is a Home not a House. Island Club nestles around a 23-acre fresh water lake. Why buy a condo when you can have a single family home in a gated community. Best of all, Island Club is very affordable. HOA fees include Clubhouse with lots of activates, Tennis, Pickle Ball, Shuffle Board, Bocce ball, Pool and Spa also includes your Cable TV and water and lawn maintenance, all for $590.00 per 1/4. Close to malls restaurants, RSW Airport and Hertz arena and FGCU. Estero Has it all. Island Club At Corkscrew Homes: HEAVILY UPGRADED SINGLE FAMILY HOME IN ESTERO! Welcome to Island Club at Corkscrew, what we like to refer to as Esteros best-kept secret! This charming 3 bedroom, 2 bathroom split floor plan home is what you've been waiting for! The sellers took much pride in upgrading this home and have kept it in mint condition! Featuring beautiful Pergo flooring, crown molding and upgraded baseboards throughout the main living areas. Embrace your inner chef as not a detail has been overlooked as you enter the fully upgraded kitchen; from the custom wood cabinetry, the pendulum lighting, upgraded granite, glass front cabinets, built in bread box and soft close drawers. If the rest of the house already has not left you in awe imagine enjoying your morning coffees being gently kissed by the Florida sun while sitting on your extended fully enclosed Florida room! Offering prime location with easy access to RSW International airport, one quick turn to I-75, minutes to Miromar Outlets and Coconut Point Mall, shopping and dining options galore! Fabulous schools! Where else can you find a single family home in a gated community at this price point?! LOW HOA fees! Dont wait as this one will not last! Island Club At Corkscrew Homes: NEW ROOF! This beautiful home offers easy-care living that many dream of. From the quartz counters in the bathrooms to the crown molding in the living room, the travertine flooring in the lanai and custom lighting throughout, it’s clear no expense has been spared in the creation of this lovely home. There are two bedrooms, two baths and a den, including a master ensuite w/ walk-in shower. The living room is bright and light-filled, with a sliding door that opens into the lanai. A wonderful kitchen with plenty of storage and newly installed recessed lighting is open to the dining area, while easy-care tiled floors are featured throughout. Step outside to a sunny patio with a retractable awning, where you can relax any time of the day. A two-car garage, spacious den with plantation shutters, and an internal laundry room complete the floorplan. A host of updates have been completed in the past couple years as well, including fresh paint inside and out, a new air-conditioning unit, accordion shutters, an updated water heater and a new roof. GREAT Lot with preserve view and yard. Nestled against a lush peaceful backdrop! Island Club At Corkscrew Homes: One of the most affordable single family homes in Estero! The Island Club at Corkscrew is a lovely gated community located off Corkscrew Rd, just west of I-75. This adorable, well-kept home features 3 bedrooms, 2 full baths and a 2-car garage! Master Bath was renovated in 2014. New Carpet just installed in Bedrooms! Ceramic Tile in All other areas! In-home Laundry Room with pantry/storage closet! Screened Lanai with Pan Roof! Screen Doors on Garage Door! Low HOA fees ($197 mo) include water, sewer, cable TV, lawn care and an array of amenities (pool, spa, tennis, bocce, shuffleboard...). Within minutes to Miromar Outlets, Hertz Arena, FGCU, Coconut Point, Gulf Coast Town Center and the Airport! Island Club At Corkscrew Homes: Move right into your next home in the highly sought-after Estero area. You are a mile away from Miramar outlets, Coconut Point Mall and the best shopping and dining in Fort Myers-Naples area. Just minutes from I-75, Southwest Florida International Airport and 20 minutes to the beach. Lowest HOA fees in the area which includes water, basic cable, lawn care, trash, water, sewage, clubhouse amenities include shuffleboard, bocce ball, tennis courts, swimming pool, spa, exercise room and library. New exterior and interior paint, French doors to screen lanai, new bathroom and kitchen sink fixtures, crown moldings and professional landscaping. Property qualifies for wind mitigation insurance discount. Lake access is a short walk across the street. Island Club At Corkscrew Homes: Charming 2 bedroom, 2 bath single-family home at the Island Club at Corkscrew in sought after Estero! Being sold turnkey furnished. This beautiful home features an open floorplan, tile throughout main living areas, and 1.5 garage. Kitchen offers plentiful cabinetry and overlooks great room. Master bedroom features walk-in closet and en suite with walk-in shower. Guest room has a full bath with bathtub. The unit backs up to central covered gazebo with grills and table. Perfect for entertaining! LOW HOA FEES that include city water and sewer, lawn care, and cable TV. Island Club is an active community that hosts many organized activities and offers a variety of amenities such as heated pool and spa, tennis/bocce/pickleball courts, shuffleboard courts, 23 acre lake, and a 5,800 sq ft clubhouse. This community offers a central location near I-75, shopping, dining, SWFL International airport, and world-renowned SWFL beaches! Need professional assistance selling your property at Island Club At Corkscrew Estero? Find out how an Area Specialist can help to generate more property exposure in order to get the most money for your investment in the least amount of time.